The pursuit of excellence is no longer optional. More precisely, the pursuit of excellence across the board in your IT processes and practices is no longer optional. I came to this conclusion after reflecting on some of the 2015 State of DevOps Survey results that Nicole Forsgren shared in her recent GOTO London talk, and wondering what could explain the two-orders-of-magnitude discrepancy between the best and worst performers. The light bulb moment for me was making a connection with ‘The O-Ring Theory of Economic Development.’ I’ll explain that theory and how it fits later in this article. I love simple models with great explanatory power (for example, the USL), and O-Ring theory certainly fits the bill. Based on this, I speculate about an O-Ring Theory of DevOps that explains how even a small drop in quality levels across the board, or one or two weaker areas, can have a dramatic effect on the overall output of the organisation. The 2015 State of DevOps survey found a 200x (two orders-of-magnitude) gap in lead times between the best and worst performers. Not just a little bit better, or 2x better, or even 20x better, but 200x! And the best performers aren’t just moving faster, they’re also delivering higher quality: 60x fewer deployment failures, and a 168x faster MTTR in the event of a failure. It seems that instead of ‘move fast and break things’ we should perhaps be talking about ‘move fast to fix things!’ Instead of trading-off between feature delivery speed and quality, it turns out that they are instead correlated. O-Ring Theory can explain both how large gaps can arise between the very best performers and the rest, and how quality and velocity are intimately related. These differences really matter. An organisation moving 200x faster has 200x the opportunity to learn and improve based on feedback. The survey also found that the highest-performing organisations are also 2x more likely to exceed profitability, market share and productivity goals, and had a 50% higher market cap growth over 3 years. Productivity is the ultimate engine of growth in the global economy. Raising productivity is therefore a fundamental challenge for countries going forward…. the growth of the globally most productive firms has remained robust in the 21st century. However, the gap between those global leaders and the rest has increased over time, and especially so in the services sector. 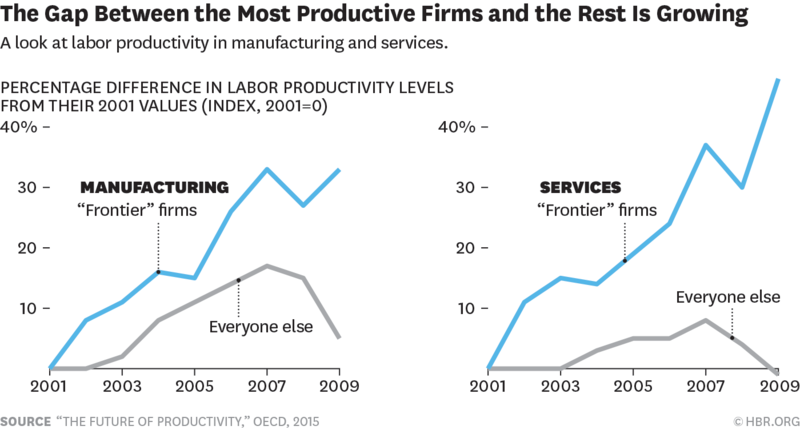 (image credit HBR, ‘Productivity is Soaring at Top Firms and Sluggish Everywhere Else’. … This report marks the start of a renewed and concerted effort across the OECD to put productivity at the heart of our work on strong, inclusive, and sustainable growth. As an example of the third condition, if you’re trying to produce a great meal, you can’t substitute two mediocre chefs for one great one. Consider a production process consisting of n tasks to produce one unit of output (firms can replicate the process an arbitrary number of times). Each task is undertaken by a worker, who performs the task at some quality level q. A worker’s skill (or quality) at a task q, is defined by the expected percentage of maximum value the product retains if the worker performs the task. Thus, a q of 0.95 could refer to a worker who has a 95% chance of performance the task perfectly and a 5% chance of performing it so badly the product is worthless, to a worker who always performs a task in such a way that the product retains 95% of its value, or to a worker who has an 50% chance of performing the task perfectly and a 50% chance of making a mistake that reduces the value of the product to 90% of its maximum possible value. Let qi represent the quality level of the worker performing the ith task for i ∈ 1..N.
Let B be the output per worker with a single unit of capital if all tasks are performed equally. Small differences in quality produce large differences in output (and worker wages, in the economic model). Similarly, if we have 9 outstanding workers (q=0.99), but one that is mediocre (say, q=0.5) then the output also drops dramatically to 4.57 (and with two mediocre workers and 8 great ones to 2.31). Conversely, if we have 9 mediocre workers, and one great one, the highly skilled worker does not pull up the output very much – we get production of 0.02! The more great workers a company already has, the more incremental value another great worker adds. Let’s now test the three O-Ring Economic Theory conditions against a DevOps pipeline, where the ‘worker’ for each stage may be a human or an automated process step. We’re looking at the production process for a single unit, e.g. a feature moving along the value stream from inception to production. The ‘value’ of our output we will consider as how quickly and accurately we can get features into production. To test the three conditions, we’ll need to work out what ‘quality’ means for us when assessing the value of each worker. We’re interested in the velocity of features released into production, so intuitively our definition of quality should incorporate some notion of the time taken to perform the step, as well as the quality of the artefact produced by the step. Borrowing from value stream mapping, we can use the concepts of lead time and percent complete and accurate. Lead time is the elapsed time from the moment work is made available to a process step, until it is completed (and includes any queueing time and delays). Percent complete and accurate (%C&A) is the most transformational metric we’ve encountered. It reflects the quality of each process’s output. The %C&A is obtained by asking downstream consumers what percentage of the time they receive work that is ‘usable as is,’ meaning that they can do their work without having to correct the information that was provided, add missing information that should have been supplied, or clarify information that should have and could have been clearer. For a DevOps pipeline we’ll treat %C&A as the percentage of time a downstream consumer receives an output that they can use without causing errors. α, β are simply weightings we can use to adjust the relative importance of %C&A and lead time, where α + β = 1. Note that if we produce output that is 100% complete and accurate, and do so with the same lead time as the best in the world, then quality is 1 (100%). Production depends on completing a series of tasks. This clearly holds for a DevOps pipeline. Which will give us a nice scale from 0-100. A single weak link in your DevOps pipeline brings down your overall output dramatically. It’s not enough to be good in one or two areas and mediocre everywhere else, you need to be good (or great) across the board. Small differences in quality (i.e, in how quickly and accurately you perform each stage of your DevOps pipeline) quickly compound to make very large differences between the performance of the best-in-class and the rest. (Two orders of magnitude perhaps, as seen in the data from the State of DevOps Practice Survey?). The better you already are, the more value you get from improving your weaknesses. Conversely, if you’re fairly poor across the board, you won’t get as high a return on investment on an improvement in one specific area as a company with a higher overall level would. These forces tend to lead to ‘skill-matching’ – fairly uniform levels of performance across the board in the various steps of a DevOps pipeline for a given organisation. If you want to be a high performing organisation, the pursuit of excellence across the board in your IT processes and practices is no longer optional. Fascinating connection – thanks for the write-up! One part of the analogy I’m struggling with a bit, though, is relating the quality of the pipeline (i.e. the chance of a pipeline run progressing to completion) with the quality of the output (i.e. the likelihood that a feature that makes it to production works as intented). For the former, the analogy seems to work well: the probability that a pipeline run completes is determined by the failure rate of the individual steps, although I’m not sure that “You can’t substitute quantity for quality.” holds here: if your step to provision a test environment is error prone, you can simply try to provision N test environments in parallel – for suitably (potentially wastefully) large N, you’re almost guaranteed to end up with an environment that works. However, the link between the quality of the pipeline steps and the resulting output in terms of working features seems less clear: the steps in a CD pipeline don’t tend to “incrementally contribute” to the result, especially if we’re talking about pushing a single feature through the pipeline (rather than e.g. a release train setup where we may be trying to deploy N related microservices at the same time). For example, a step to automatically provision a test environment can’t usually be done “94% correctly” – it will typically either succeed or fail, aborting the pipeline run. So a “poor” pipeline with a high failure rate will decrease throughput, but will not necessarily result in a degraded final product. Surely you’re joking, Mr. Colyer. This post partly resonates with what I am currently reading, which is Steven J. Spear’s book “The High-Velocity Edge”. In the book, there is a much higher emphasis on how the process should be improved so that all steps in the workflow are of much higher quality. This post and the video put a greater emphasis on the quality of people involved in the process. Taking this more into the world of DevOps, I rather choose the explanation for the potentially low quality due to process problems, not because reliance on quality people didn’t prove itself and people were sub-par from perfect in performing their tasks. The last paragraph can be explained by the Lean concept of Handoffs as an anti-pattern. Whenever you introduce another node in the graph, you’re adding complexity. Hand-offs are preferably avoided for this reason — the complexity is waste, which you can articulate as the opportunity to reduce C/A%. The other waste is Delay — every node introduces the opportunity for queuing.